With jangling guitars and cooing vocals from Anna Fox Rochinski, Boston’s Quilt pairs new single “Roller” with black comedy in the Adi Putra-directed video. Borrowing liberally from Wes Anderson’s The Royal Tenenbaums, the ghosts occupying the video for “Roller” are much cooler than any of your own family members. 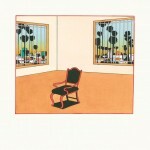 “Roller” is the second single from the band’s forthcoming album, Plaza. To be released on 26 February, Quilt will kick off a North American tour in Boston that same day. Full schedule here. Watch the video for “Roller” below and pre-order Plaza on vinyl and CD via Mexican Summer.